We designed the Flight Monster to meet multiple needs: Flight Bag, Oversized Red Bag, Out-of-County Bag. 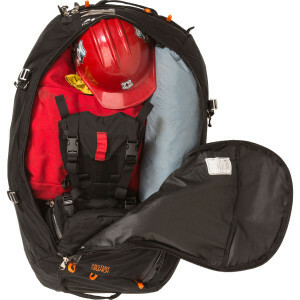 The terms to some extent depend on the agency, but in the end this is a full-featured, high volume duffel bag. First, the bag had to work as a Hotshot type flight bag: big enough to fit fire gear, tent, sleeping bag, pad, and personal gear, for those times when a crew transport is transported via fixed wing. But flight bags tend to get used for a broad range of applications, like spiking and an ensuing packout. When you have a bag of this size, it inevitably ends up heavy, and can get extremely heavy. We put multiple carry options on it, all of which stow away. Backpack straps as padded and ergonomically shaped as our fire packs’, a 2″ duffel style shoulder strap, and traditional haul handles. The stowability is for streamlined travel, both air and wheeled, as well as providing the user with the option to eliminate strapiness and excess harnessing without sacrificing features. Any duffel bag also has to function as a travel bag, however, and this was something we kept coming back to in our development process. No matter what we called it, or how specific the features, this would be utilized as a straightforward cargo duffel–an oversized Red Bag, war bag, Out-of-County bag—and we built some features specific for that purpose. The compressible, segregated laundry bag is an example of this. Halfway through an assignment, sometimes you can lose track of what’s been worn and what hasn’t. And we did a few simple things, like the ID window, and a small internal detail pocket. 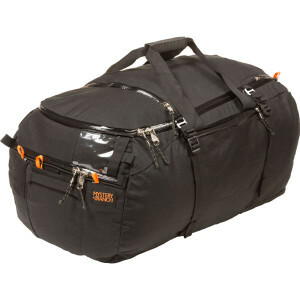 At the end of the day, it’s a big, burly duffel built of 500 and 1000 denier cordura. It has no structure until it’s packed, so it can be rolled up small and stowed in buggies and vehicles without taking up too much valuable storage space.